Given the latest technological developments within the area of philately, the new techniques which are being applied to printed stamps, products and the advance digital platforms, this year's PostEurop Philatelic Forum, created the opportunity for Members and Stakeholders to gather in a cohesive environment in order to discuss and exchange ideas on such topics. Hosted by Poczta Polska S.A., the Forum took place on 16 and 17 May in the historical city centre of Krakow, Poland and counted more than 100 participants, having a record number of Postal Administrations present. Mr. Przemysław Sypniewski, CEO of Poczta Polska S.A. welcomed participants on the occasion of the Association's 25th anniversary: "We have the chance to meet today, here in Krakow at the PostEurop Philately Forum. Let me take this opportunity to extend the best wishes to PostEurop, the organisation gathering European postal operators, on its 25th anniversary. These are 25 years of hard work in a complex and changing reality. On behalf of all workers of Poczta Polska, I would like to wish all of the PostEurop community further successful achievements and a good collaboration. So, may the stamp “Most w Tczewie” issued by Poczta Polska, representing a bridge in town of Tczew, be a symbol of a link between people in Europe and between all European postal operators. All the best for the future!" Following the opening message from the CEO, Mrs. Agnieszka Trząskowska, Chair of the PostEurop Stamps & Philately working group spoke about the work and latest developments that are being carried out by PostEurop, in the field of philately, particularly on the European-wide initiative - EUROPA Stamps. To finish the introductions before the start of the presentations, a video message from our Secretary General, Mr. Botond Szebeny, was presented to all of the participants as he could not attend the Forum due to a parallel high-level event in Canada. In the message he underlined the importance of philately in the PostEurop Market Activities Circle and of the Philatelic Forum in particular. He concluded his message by thanking Poczta Polska S.A. for the great support provided and gave his best wishes for the success of the event. As previously mentioned, the aim of the selected presentations was to provide the opportunity for the attendees to dive into these new solutions, services, products and techniques. We were able to see demonstrations of stamps/stamps sheets printed with gold leaf techniques and micro watermark details, interactive stamps that contain microchips which react to the costumer's phone and other devices, printers that can produce multiple textures, digital machines that can directly print stamps from live photos, or new digital platforms for selling collectable items. 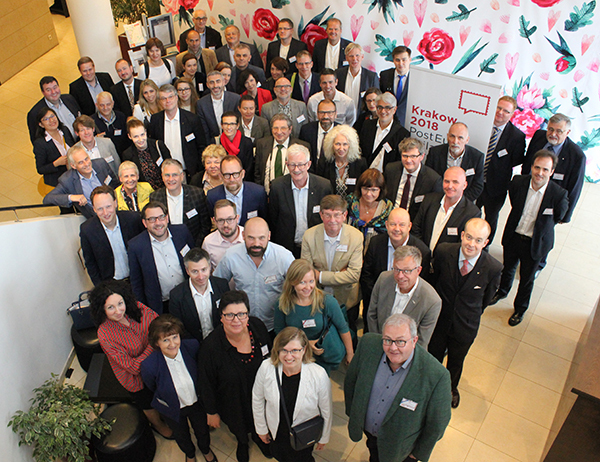 PostEurop inspired postal operators with the fruitful presentations, discussions and collaboration in order to show the different digital platforms that can further improve their operations and also show how their customers can be better protected from fraudulent philatelic activities. The two-day successful event was structured by having the presentations during the morning session, which were then followed by a question & answer slot. The afternoon sessions were reserved for meetings and networking amongst attendees, giving both the opportunity for sponsors to showcase their different solutions and services, and for speakers to further discuss their morning session presentation. "We are pleased at the quality presentations and high-level of engagement from participants. The feedback received from the participants at the end of the event, was highly positive and valuable for us, as we can further develop the next Forum" confirmed Agnieszka Trząskowska, Chair of the PostEurop Stamps & Philately working group. While Emile Espen, Vice-Chair, added “It was very satisfying to see how well the new concept of the Forum worked. The participants fully seized the opportunity of the two afternoons dedicated to meetings and networking. They got in contact with each other, many for the first time and were able to build new fruitful relationships." The Next PostEurop Philatelic Forum will be held in 2020 on a venue still to be confirmed by the Stamps & Philately working group. POSTEUROP is the association which represents European public postal operators. It is committed to supporting and developing a sustainable European postal communication market accessible to all customers and ensuring a modern and affordable universal service. Our Members represent 2 million employees across Europe and deliver to 800 million customers daily through over 175,000 counters. View all the beautiful entries and vote for your favourite stamp on www.posteurop.org/europa2018. The online competition will end on 9 September 2018 and the winning stamps will be announced at the PostEurop Plenary Assembly to be held on 3 October 2018 in Georgia.